University of California, San Diego, 1977. Georgetown University School of Medicine, 1981. Intern, Department of Surgery, University of Virginia, Charlottesville, 1981-1982. Resident , Neurological Surgery, University of Virginia, 1982-1987. American Board of Neurological Surgery, 1990. Dr. Grady was appointed the Charles Harrison Frazier Professor & Chairman of the Department of Neurosurgery at the Perelman School of Medicine, University of Pennsylvania in March 1999. He received his undergraduate degree from the University of California, San Diego and medical degree from Georgetown University School of Medicine. He trained in Neurological Surgery at the University of Virginia from 1981-1987 and was a faculty member at the University of Washington from 1987-1999. He is Board Certified by the American Board of Neurological Surgeons and is a fellow of the American College of Surgeons. 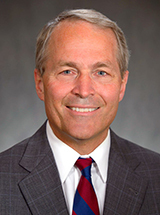 Dr. Grady served as the Secretary for American Board of Neurological Surgery from 2004-2008, and was appointed Chairman of the ABNS from 2008-2009. Dr. Grady served as a member of the editorial board for the Journal of Neurosurgery from 2000-2010. Dr. Grady's clinical focus is in the area of Cranial Base Tumors, Pituitary Tumors, Meningiomas, Schwannomas, Malignant Skull Base Tumors as well as Cerebrovascular Disorders, Aneurysms, AVM's. Dr. Grady and Dr. Bert O’Malley (Chairman, Department of Otorhinolaryngology - Head and Neck Surgery) are co-directors of the Cranial Base Center. In addition, Dr. Grady performs general neurosurgery procedures for herniated discs of the back and neck. Philadelphia Magazine Top Doctors 2004-2011. Lee JYK, Cho SS, Zeh R, Pierce JT, Martinez-Lage M, Adappa ND, Palmer JN, Newman JG, Learned KO, White C, Kharlip J, Snyder P, Low PS, Singhal S, Grady MS: Folate receptor overexpression can be visualized in real time during pituitary adenoma endoscopic transsphenoidal surgery with near-infrared imaging. J Neurosurg 129(2): 390-403, Aug 2018. Swanson RL, Hampton S, Green-McKenzie J, Diaz-Arrastia R, Grady MS, Verma R, Biester R, Duda D, Wolf RL, Smith DH: Neurological Manifestations Among US Government Personnel Reporting Directional Audible and Sensory Phenomena in Havana, Cuba. JAMA 319(11): 1125-1133, Mar 2018. Ali ZS, Ma TS, Ozturk AK, Malhotra NR, Schuster JM, Marcotte PJ, Grady MS, Welch WC: Pre-optimization of spinal surgery patients: Development of a neurosurgical enhanced recovery after surgery (ERAS) protocol. Clin Neurol Neurosurg 164: 142-153, Jan 2018. Morris J, Na YJ, Zhu H, Lee JH, Giang H, Ulyanova AV, Baltuch GH, Brem S, Chen HI, Kung DK, Lucas TH, O'Rourke DM, Wolf JA, Grady MS, Sul JY, Kim J, Eberwine J: Pervasive within-Mitochondrion Single-Nucleotide Variant Heteroplasmy as Revealed by Single-Mitochondrion Sequencing. Cell Rep 21(10): 2706-2713, Dec 2017. Ma TS, Sharma N, Grady MS: A simplified pressure adjustment clinical pathway for programmable valves in NPH patients. Clin Neurol Neurosurg 159: 83-86, Aug 2017. Piazza M, Nayak N, Ali Z, Heuer G, Sanborn M, Stein S, Schuster J, Grady MS, Malhotra NR: Trends in Resident Operative Teaching Opportunities for Treatment of Intracranial Aneurysms. World Neurosurg 103: 194-200, Jul 2017. Wolf JA, Johnson BN, Johnson VE, Putt ME, Browne KD, Mietus CJ, Brown DP, Wofford KL, Smith DH, Grady MS, Cohen AS, Cullen DK: Concussion Induces Hippocampal Circuitry Disruption in Swine. J Neurotrauma 34(14): 2303-2314, Jul 2017. Thawani JP, Ramayya AG, Pisapia JM, Abdullah KG, Lee JY, Grady MS: Operative Strategies to Minimize Complications Following Resection of Pituitary Macroadenomas. J Neurol Surg B Skull Base 78(2): 184-190, Apr 2017.